Reform plans and capital investments since the 1980s have turned China into the second biggest economy in the world. Its role in the world trade has increased immensely. Due to political and economic developments, China’s global influence has also increased. To sustain and improve its influence, China has established alternative international institutions such as BRICS, Asian Infrastructure Investment Bank (AIIB), and Shanghai Cooperation Organization (SCO). Besides these organizations, China has started to act directly in different regions such as Africa and Latin America. However, China’s increasing investments and activities in Africa have disturbed another actor, i.e. the U.S. and caused tension. Also, China’s relations with the U.S. can be analyzed within the context of the former’s relations with Russia. With the Trump presidency, China and Russia see the U.S. as a threat. They need to have a strategic partnership to overcome this threat. China’s relations with Turkey have always been consistent. 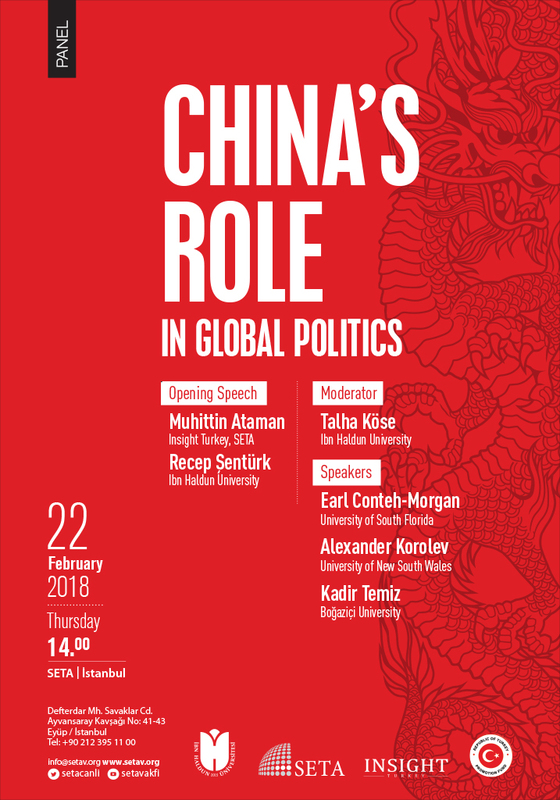 China has always been neutral to conflicts regarding Turkey with the exception of the Cyprus issue. China stood closer to the southern Cyprus stance. Despite this, Turkey has not considered using its political and economic power. Note: Panel discussion will be translated to English and Turkish. Hereby, we cordially invite all those who might be interested to participate in the panel.